Children on the autism spectrum and their families are invited to a special morning of artistic exploration. Starting before public hours, children can participate in art activities, gallery experiences, and music therapy, all at their own pace. Structured support, social narratives, and noise-cancelling headphones will be available, as well as a quiet space with sensory toys. Space is limited, and advanced registration is required by registering online, visiting the Crocker Art Museum admission desk, or by calling the Crocker at (916) 808-1182. The event is free for children ages 3 to 12 and their caregivers. 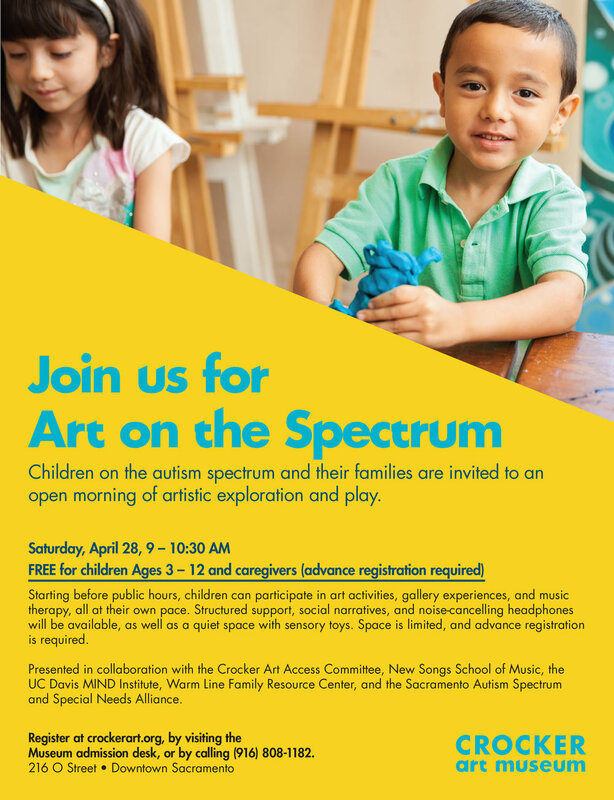 Presented in collaboration with the Crocker Art Access Committee, New Songs School of Music, the UC Davis MIND Institute, Warm Line Family Resource Center, and the Sacramento Autistic Spectrum and Special Needs Alliance.